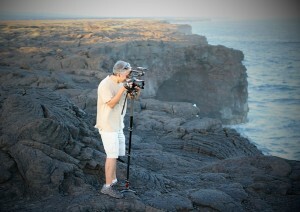 Explore Hawaii Volcanoes National Park in this video from John Yasunaga. Today Hawaiʻi Volcanoes National Park displays the results of at least 70 million years of volcanism, migration, and evolution in the Hawaiian Island-Emperor Seamount chain-processes that would thrust a bare land from the sea and clothed it with complex and unique ecosystems and a distinct human culture. Created to preserve the natural setting of Kīlauea and Mauna Loa, the park is also a refuge for the island’s native plants and animals and a link to its human past. Park managers and scientists work to protect the resources and promote understanding and appreciation of the park visitors. Research by scientists at the Hawaiian Volcano Observatory makes Kīlauea one of the best understood volcanoes in the world, shedding light on the birth of the Hawaiian Islands and the beginnings of planet Earth. Each eruption is a reminder of the power of natural processes to change the air we breath, the ground we walk on, and the sea that surrounds this volcanic island we call home. For more information visit the National Park Service website.